This connector was the standard 'in the box' type that came with most Dreamcasts and generally it offers the most basic and lowest quality connection. The little box in the middle of the two wires allows you to plug a coaxial TV aerial into it, meaning you could switch between TV and game signals in the age of analogue terrestrial TV. Image quality here is pretty lousy and sound is muffled, but back in the day most people used this simply because it was what came in the box. Indeed, many Dreamcast owners (and retro gamers in general) probably have drawers full of these things - I know I do. Absolutely useless these days to be honest, unless you have literally no other method of connecting your Dreamcast to your television. The sound and image signals are sent down one coaxial cable meaning the audio and visual components are mixed, resulting in low quality reproduction fired into your eyes and ears respectively. I have to admit that for the longest time back when I owned my original Dreamcast in 1999, RF was what I used and I still thought all the games I played looked amazing. How disgustingly ignorant the 17 year old me was. A slight step up from the RF cable, is composite. Sometimes referred to as RCA too, composite breaks the signal from the Dreamcast into three, with video and left and right audio channels all being treated to their own bit of wire. This results in a superior image and better audio when compared to coaxial RF cables. This is quite a common connection and is quite widely used as many TVs have the red, white and yellow circular connector ports on the back and the corresponding terminals are pretty easy to fathom out and plug in. Basic semiotics, innit. Where composite can get a little confusing is that you can plug the three differently coloured pins into a SCART adapter block and then use the SCART connector on the back of a TV...however this isn't true RGB SCART (more on that in a bit); it's just composite being converted into a SCART-shaped connector and doesn't really do anything to improve the image. Also, while we're on the topic of composite cables, these shouldn't be confused with component cables, which are a different thing entirely. They have more pins on the end, with the image connections split into three (green, blue and red) along with the two audio connectors. There is no component cable available for the Dreamcast (yet), but just wanted to clear that up as it's easy to confuse component and composite because they do sound quite similar (also, if you're an idiot like me it's easy to get them mixed up!). This is where you'll start to see a very noticeable difference in image quality over both composite and coaxial RF cables. While an S-Video connector physically looks quite similar to a composite cable because it has multi-coloured bits dangling off the end, it gives a better image because it further divides the video signal into different channels. With composite, all of the video travels down the yellow cable, but with S-Video, the funny looking connector with the four holes in the end is splitting the video into luminescence (black and white) and chrominance (colour), which gives a cleaner and better image than composite can. S-Video connections on consumer TVs are not as widespread as either SCART, composite or RF so you may never have even seen one of these connectors (or had any reason to track one down), but a couple of televisions I have owned have had them, and also the capture device I used to use had one too and the image clarity was leagues ahead of anything the composite inputs could achieve. If you don't have SCART or VGA sockets on your TV, but you do have S-Video, then this is your best bet. 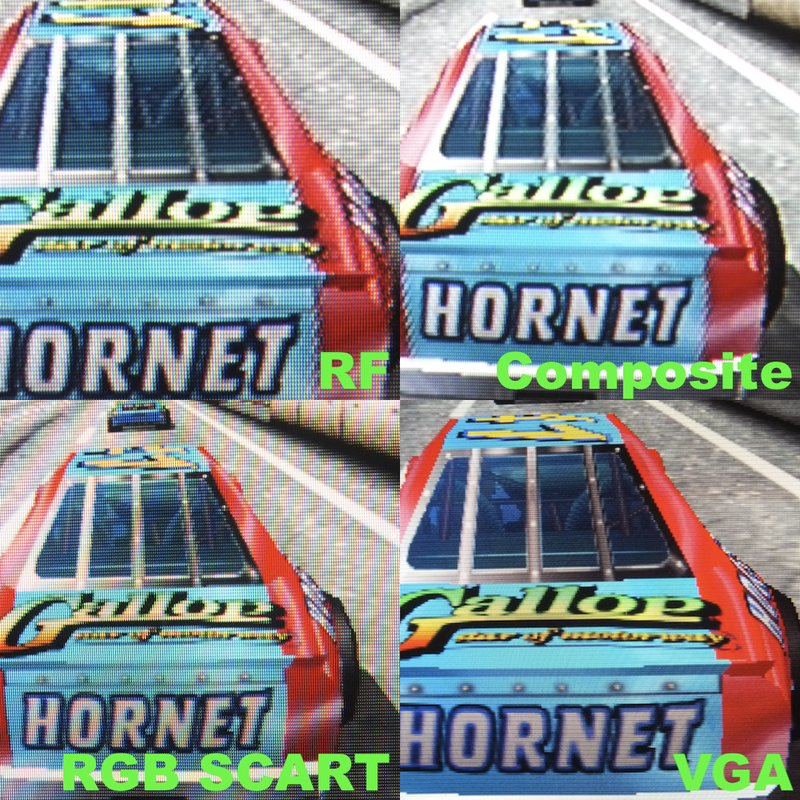 As with composite you can also quite easily find S-Video to SCART blocks so you can use an S-Video connection even without the proper inputs on your television...but then, if you have a Scart socket you might as well just use RGB SCART. SCART is considered by many gamers to be the ultimate way to connect older games consoles to CRT televisions, and who am I to argue? When it comes to using original hardware with contemporary television sets, and without forking out for an upscaler or any other external hardware, then RGB SCART is definitely the route to go down. SCART stands for 'Syndicat des Constructeurs d'Appareils Radiorécepteurs et Téléviseurs' - the French Radio and Television Receiver Manufacturers' Association; the body from which the standard originates. Essentially, what RGB SCART does is split the video and audio signals from the Dreamcast (or any other system that uses it) into different channels which are then delivered to the display through the individual 21 pin socket on the end of the cable. That's not to say that all 21 pins are actually used - indeed some SCART connectors don't have all 21 pins included because the unused ones are just left out. Confused yet? It's a hell of a lot more complicated than that in truth, and if you want to read up on the science behind SCART (or any of the connectors listed in the article), then there are a wealth of sources out there that will provide the details. However, for this I wanted to really focus on the basics for those who are new to the Dreamcast. 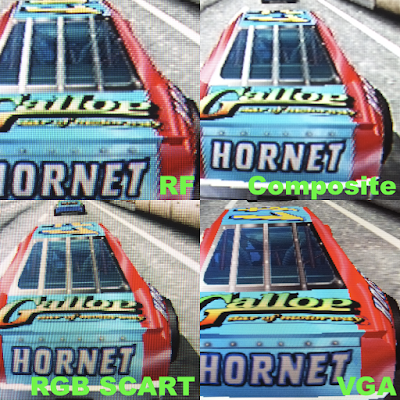 The picture quality when using RGB SCART on a CRT television is pretty outstanding, offering a level of crispness and rich colours that the others simply cannot match. The only real downside to RGB SCART is that while it was a standard in Europe, meaning pretty much all televisions came with SCART connections, in the USA it's quite an uncommon connector - or so I'm lead to believe. Due to this some NTSC-U Dreamcast games don't actually allow you to use RGB SCART connections, with Skies of Arcadia being a prime example. Still, if you have a PAL Dreamcast and a decent CRT television with a SCART socket on the back, then grab an RGB SCART cable and you'll be laughing. 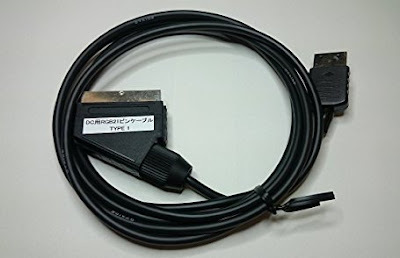 It's worth noting here that there's also a Japanese equivalent of SCART called JP21 (see above), which looks identical in terms of physical design, but which is a little different. There is no official Sega Dreamcast JP21 cable, but there are third party ones. The pins on this connector are wired in a different configuration and if connected to incompatible devices can actually cause damage (and likewise with RGB SCART connected to a JP21 device). This is definitely worth being aware of if you buy a Framemeister as the connection on there is JP21, and plugging an RGB SCART into it could theoretically knacker it. The best way to be sure is to make sure you know which type of adapter you have before you go plugging it into stuff, but you're probably not going to run into JP21 cables unless you specifically go looking for one. All of the previously discussed connection types output either a 240p or 480i image, but things take a significant step up when we move on to VGA. The Dreamcast was quite unique back when it launched, in that Sega saw fit to bequeath the system with the ability to output a 480p signal for use with CRT computer monitors. This was quite possibly because of the crossover between PC and console that Sega was aiming for, what with internet browsing, email and all that malarky. However, it also probably had quite a bit to do with the fact that the NAOMI system on which the Dreamcast is based also had 240p and 480p outputs, and so it made sense that the Dreamcast should be able to hook up to a display that could handle such resolutions natively. These days, it's getting harder and harder to find a proper CRT computer monitor that will accept a VGA input, but if you do have one at your disposal then connecting a Dreamcast to it will yield some pretty eye-watering results. Quite simply, using a Dreamcast with a VGA cable or box, and a CRT computer monitor will make your games look far better than anything you could hope to achieve on a regular television. The only downside is that not all Dreamcast games are compatible. As stated, the image resolution is 480p (sort of) which back in 1999 was mind blowing. It still looks great today, but that's besides the point. There are a range of official and unofficial VGA connectors available for the Dreamcast and while many people may prefer to seek out an official Sega-branded VGA box, the numerous unofficial ones do pretty much the same job. Furthermore, some VGA connectors are simply cables while others are boxes, and for the most part you'll need to add separate speakers to this type of setup because VGA only carries the image signal through the cable - sound is dealt with separately either via a 3.5mm jack or separate left and right audio cables. Since those halcyon days of the late 1990s and early 2000s, plenty of new devices have emerged that take advantage of the Dreamcast's VGA mode, the most recent being the Akura HDMI box from Beharbros. What this essentially does is take the 480p signal from the Dreamcast and convert it so that you can use a HDMI cable and plug it into a standard HD television and still get some of the benefits of VGA mode. Many HD TVs also have VGA connections on them as standard too, so if you don't happen to have a PC monitor just knocking about in your gaff, then you can still get a decent picture using VGA on your telly. It isn't as good as using a proper CRT PC monitor, but it isn't bad by any means. Be sure to use this handy VGA compatibility list from Sega Retro to see which games will accept this connection method. So there are your main connection options when using a Dreamcast. There are a million and one different versions of the various cables out there, both official and from third parties and this is by no means a definitive guide to getting the best image from your Dreamcast. Because every gamer has a different setup and different preferences then the one you chose is a personal choice. Oh, and then there's the small matter of being able to afford some of them. There's also a whole other sub-section of this topic that involves upscalers and other external image processors but that's a topic for another post. Likewise the whole PVM rabbit hole. Hopefully with this beginner's guide though, you'll glean a little bit of information that you maybe didn't have, and be able to get the best from your Dreamcast, dependent on your needs/tastes. Thanks to Ross O'Reilly for fact checking all this for me - I should probably have let him write all this guff, but what can you do eh? I should also add that I'm far from an expert in this field. Most of my knowledge has been imparted by far more learned people, but hopefully this little guide will ignite a spark of curiosity in you and you can go on to find out more yourself. I know this is an older post but just wanted to mention my findings. I recently got a new 4K TV without VGA or Scart port but I do have an original VGA box and both the Toro and Akura, after extensive testing I have found the best way to connect a Dreamcast has to be using the Toro via RGB Scart using its unique 480p mode via the Scart cable which is then connected to the Framemeister XRGB-mini (I believe this is the only device that accepts this signal). Its an expensive option but I already had the XRGB-mini for other consoles anyway and this method gives a sharper clearer image than the Toro, but not only that I have also found you get the 480p quality but with a perfectly centred image. I expect the only superior option would be the internal HDMI mod which would be completely digital.